This week marks the 119th birthday of the great American economist Henry Hazlitt, who lived from 1884-1993. 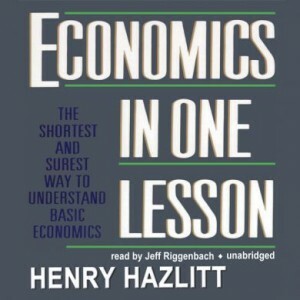 While Hazlitt made many contributions to the field of economics, he is best remembered for his short book, Economics in One Lesson. First appearing in 1946, the book provided a succinct defense of Austrian economics in the face of the neo-classical, math-based approaches that dominated the debate. While the book has sold over one million copies, Hazlitt was not successful in convincing most of the public (and especially academics) that economics is not just an extension of mathematics, but rather a social science based on principles of human action. For this reason, it is as important as ever to reflect on the central lesson of his seminal work. He argued that good economists must consistently apply this simple principle. Let us see how his short lesson can be applied to today’s major policy debates. First, take the Affordable Care Act. It may provide health insurance to a larger portion of the population and higher premiums for young, healthy people are usually offset by subsidies, but there is more to the story. A person who disregards Hazlitt’s lesson would assert that the law is a win-win and its relative merits are closed for debate. On the other hand, a true economist would look at larger, wide-scale implications of the law—those which are not immediately seen. When this perspective is adopted, one realizes that subsidies do not come from nothing; they are financed through present or future taxation. Hazlitt showed that the negative effects of taxation arise not only from a reduced incentive to produce, but also from the idea that individuals usually make better use of their money than bureaucrats or politicians do. As Hazlitt says, it is very unlikely that “wealth created by government spending will fully compensate for wealth destroyed by the taxes imposed to pay for that spending.” Private spending is almost always more efficient and productive than government spending. When individuals’ incomes are not reduced through taxation, they are free to either spend or save the additional money. Here lies the problem with stimulus spending, or government spending in general. It is often forgotten that when income is saved, it is still spent. What is meant by this is when someone puts their savings in a bank, the money does not sit in a vault collecting dust. Rather, the bank lends it out. This is why investments are so important; they move funds from savers to spenders—to those who can put the money to better use now. While the immediate benefits of raising the minimum wage may appear positive, when Hazlitt’s economic way of thinking is adopted one can see this type of labor market distortion has negative, unintended consequences. Besides those whose skills are below the minimum wage losing their jobs, future workers with low skills are blocked from entering the labor force. This especially hurts young people trying to develop human capital by acquiring experience for future careers. Hazlitt would also have something to say about the Federal Reserve’s long-running bond purchases and low interest rates. He worried about the ills of inflation that inevitably come from accommodative monetary policy, and warned against its seduction. Since money acts as a store of wealth (you can exchange if for things of real value such as a TV or car), people are led to believe that government increasing the money supply makes everyone richer. While the public may have more money, they are not any wealthier than before. Instead, the result is increased prices for everyone and a reduction in people’s faith in money’s exchange value. This can create dangerous consequences since money is worth nothing on its own—try producing anything from a flimsy green piece of paper. Mutual faith that the piece of paper will hold its value and be accepted by others in future transactions is necessary for money to perform its function as a medium of exchange. Inflation has the potential to undermine both of these foundations. It is always beneficial to revisit the lessons of great economists. Without a doubt, policy makers would be better equipped to promote economic growth if they could avoid the seduction of immediate economic effects and instead understand the secondary consequences of laws and regulations. This holistic view is necessary for the world’s economy to recover from the mistakes of well-intentioned, but short-sighted policies. Jared Meyer is a research associate at the Manhattan Institute for Policy Research. You can follow him on Twitter here.